Can you read upside Down? Can you read blur Text? Can you read encrypted Text? Can you backward? Can you read double vision text? or Can you find number/face hidden in the picture? 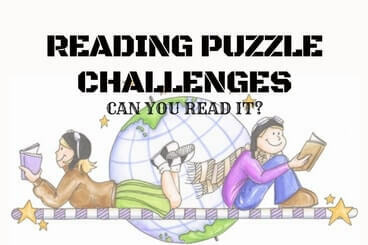 There are many types of different Reading Puzzle Challenges. Many of these challenges are published on this website. This page is to index all these reading challenges. Do click on the links below to select the reading challenge which you want to take. Do post your comment on your likes/dislikes about these reading challenges. Also let us know if there is any specific reading puzzle challenge missing on this website. We will try to prioritize your request while creating new reading puzzle challenges. Brain Teasers with Answers: Can you read this? Can your brain read scrambled words? Can you read this in first attempt? Can you read this Encrypted Text? Can you take this backward reading challenge?